How unique are you? What does it really mean to be in love? Can you believe anyone who says ‘I’m telling the truth’? Can a murder be innocent? And what is the difference between a saint, a sinner, and a suicide bomber? In this fun and entertaining book of puzzles and paradoxes, Peter Cave introduces a smorgasbord of life’s important questions with tales and tall stories, jokes and arguments, common sense and bizarre conclusions. From how to get to heaven, to speedy tortoises, paradoxes and puzzles give rise to some of the most exciting problems in philosophy – from logic to ethics and from art to politics. 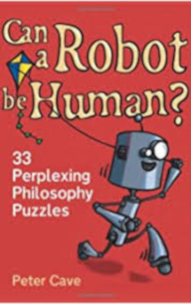 Illustrated with quirky cartoons throughout, Can a Robot be Human? takes the reader on a taster tour of the most interesting and delightful parts of philosophy. First published by Oneworld Publications (UK) in 2007.